The first national Christmas tree lighting occurred on Christmas Eve 1923, the result of an idea first put forth by President Woodrow Wilson ten years earlier. In part, the president lighting a national Christmas tree was also a way for the electrical industry trade group The Society for Electrical Development to coax consumers into purchasing more Christmas lights. Frederick Morris Feiker, an engineer who had been a technical journalist for General Electric and was a press aide to U.S. Secretary of Commerce Herbert Hoover since 1921, suggested Coolidge personally light the tree to give Christmas lights prominence and respectability. Feiker and Vermont Senator Frank L. Greene tag-teamed Coolidge at the White House and convinced him to flip the switch on a National Christmas Tree. As for the tree itself, Paul Moody, the president of Middlebury College in Coolidge’s home state of Vermont, donated a 48-foot tall balsam fir to serve as the country’s first national Christmas tree. Alumni of the college paid to have it shipped to Washington. The lower part of the tree was damaged during the journey, so branches from a healthy evergreen were tied to the flawed parts of the tree to spiffy it up. 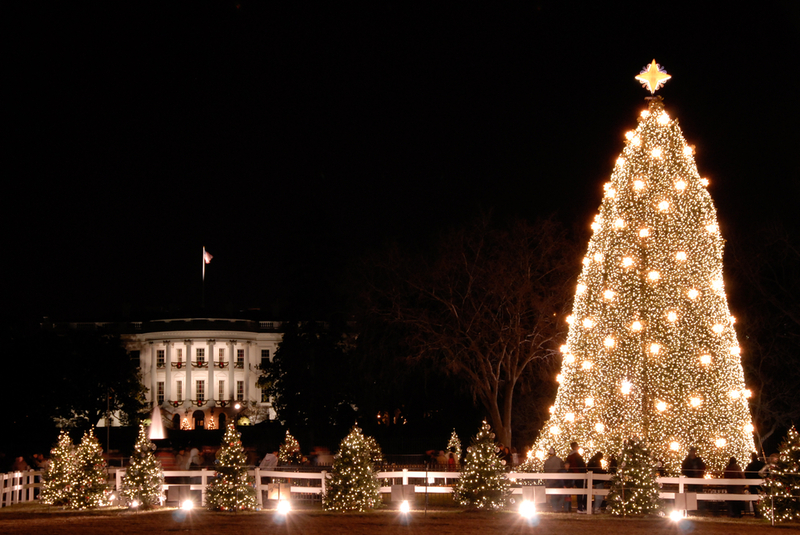 First Lady Grace Coolidge approved a location for the tree on the White House grounds, and several civic groups erected and decorated the tree in the middle of the Ellipse. The tree had more than 2,500 red, green and white lights adorning it, all donated by the Electric League of Washington. At 3 p.m. Christmas caroling at the event began, provided by the choir from the First Congregational Church, who gathered on the South Portico of the White House. Finally, around 5 p.m., President Coolidge lit the National Christmas tree by pushing a button at its foot. The First Family invited the crowd of approximately 6,000 to join them in singing Christmas carols. An estimated 3,000 more people had joined the festivities by 9 p.m. to enjoy the music of the choirs and the Marine band. By midnight, the singing had died out, and the white residents had gone home. Finally the African-American residents of the city could come out and enjoy the spectacle of the National Christmas Tree. A mass choir formed from singing groups of local community centers performed carols, and a worship service was conducted. 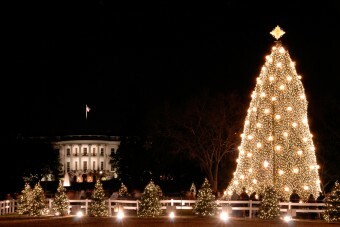 The Lighting of the National Christmas Tree has now become an annual tradition. And it’s pretty safe to say many of us got coerced into buying more than our fair share of Christmas lights since then. Feiker would be proud.